Valentine day is just two and half months away and so we are definitely sure that you would be involved in planning how to celebrate it, make it a memorable one. What’s the different thing that you can do this time? How can you celebrate this Valentine day in a unique manner? You can do it either by preparing a favorite dish of your loved one on your own and have it together. It can be enjoying the “We” time or it can be creating mind blowing DIY valentine wreath with some unique looks. These DIY Valentine Wreath ideas will definitely make your day. So, just read ahead and start collecting materials to prepare the wreath that you think will look the most beautiful. For some newly flourished young love who seems to go over the top and has all the time to do crafty things, go for this one. You need to do lots of cutting or could have a heart template and other than this hot glue gun, ribbon, 3d pops or anything creative that will look good on this wreath. Collect them all and start preparing. Read the Tutorial to make it now. If you are throwing a party at your home on this Valentine Day, this could be your choice for the decoration. It looks lavish but making it is no pain at all. You need Styrofoam as your base material and ornaments of different size and hearts would be the showstopper for you. The glue gun is your weapon because there is so much to stick with each other. Read the Tutorial to make it now. It looks like a nest of love and the fact is every nest is a love nest. If you have thought of making something ‘awww’, this is worth it. It is adorable and super easy to DIY. It has an earthy material as a base that is twigs, green leaves and pink roses complement it truly. Banner of Love completes the picture of the happy nest which should be nowhere but in front of your door. Read the Tutorial to make it now. Chenille stem is something we all are dying for and to make a Valentine wreath out of it would be an amazing idea. If you want to make the true ambiance for whole valentine day, this is for you. The time which is going to spend on this DIY would be worth and this round heart with a metal arrow is all that you want. Read the Tutorial to make it now. It is not just DIY but also do it for you. If you are the one who loves pampering yourself and in every festive occasion take the favorite corner of your house and decorate with your creativity, try this one. This wreathe will look beautiful in small size with rose petals and heart in the middle of it. Hang it with a wide ribbon and create a subtle look. Read the Tutorial to make it now. This is cute and very cheap decor piece to try your hand at DIYs. You just need an old wire (might use your old hanger) and old denim. Rest of the creativity is just turning wire into a heart shape and wrapping around the wire. You could make this wreath of different size for you the front door or also make a key ring for that door just to show some uniformity. Read the Tutorial to make it now. What better than writing down your feelings about your partner and present it on V-day? You could consider this wreath card and be sure that your feelings are conveyed in a special way. Greetings can never go out of fashion and so these wreathe greeting card. Just envelope your oceans of thoughts into few words and see the magic. Read the Tutorial to make it now. It has been named ‘easy’ because you just to have glue the wooden hearts to your wreath form however the effect it creates would be fabulous. Especially the time when you have other things in place and just in need of simple wreathe, think of this one. It looks perfect for any corner of the home and even at the welcome door. Read the Tutorial to make it now. I would like to name it as a childhood heart. If you are still a little child from inside and love making paper crafts, you are going to try this one for sure. It is looking perfect for adding a special effect of the pompom. Add as many hearts as you want of different colors and make your own very special paper wreath. Read the Tutorial to make it now. Crafts ideas can come from anywhere like tissue paper. You can make pretty flowers out of simple tissue paper and place it on heart shape cardboard to make a beautiful wreath that only goes to the welcome door of your home. Let everyone see your creative side of this decor piece. Read the Tutorial to make it now. This is a great idea for the kids to do origami decor. 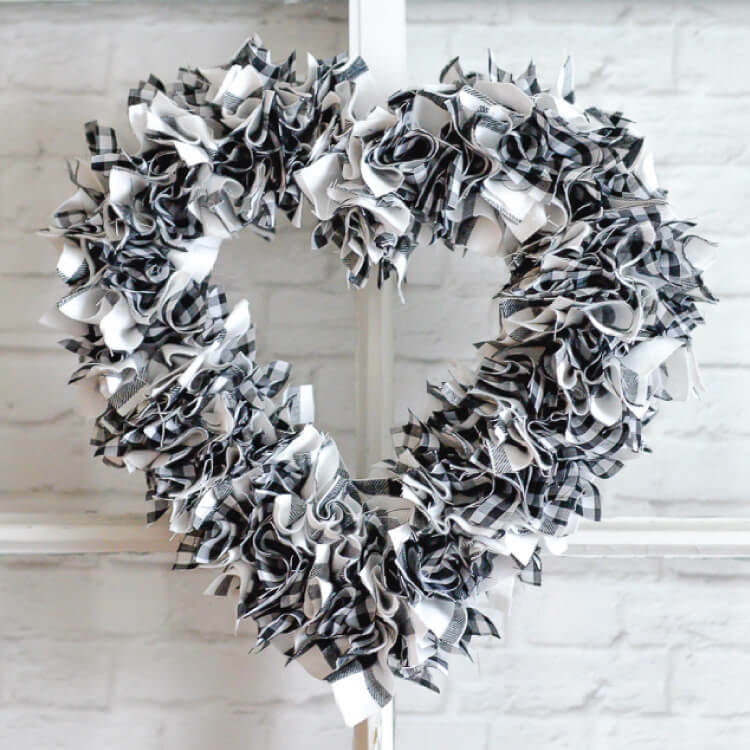 Learn how to make origami hearts in this tutorial and create a beautiful wreath out of it. The only time you need glue is when you sticking those hearts to your base. That is why I like origami crafts and you sure going to love this while creating. Read the Tutorial to make it now. Letters on the display say it all and if you like this show off kind of thing, check out this tutorial. The best part is the peek-a-boo wreathe and the white parts are all q-tips which are making it look so different and stylish. You would surely love to decor this every year. Read the Tutorial to make it now. This is my personal favorite and I don’t know why. It could be because it is different and not like every other crafty thing. If you are not at all into the paper craft, then you must watch this DIY. Just looking at this picture makes me want this. Soft copper tube, cutter and a ribbon for this elegant piece and that is it. Read the Tutorial to make it now. If you are the one who says ‘festive decorations should not be costly’, get this DIY was done and you would never complain again about festival budgets. It is not just about the budget but it makes the festival memorable and fun. I am calling it cheap because you could see around your house and search for pool noodle, old wire, and brown paper, assemble them together and wreathe is ready for the claps. Read the Tutorial to make it now. Scraps fabric could be made worth so beautifully that you can see in the image itself. The trickiest part in these kinds of wreaths is to glue them together. It looks like that you can create this messy look easily but it’s not a cakewalk. For the messy look itself, you need perfect hands which can place the scraps perfectly so you get the end look like this. Go for it if you are good at the imagination of it will look nice if I place it here. People do this every time and I am like okay! Read the Tutorial to make it now. Before you scroll down thinking this is difficult, let me tell you it is time-consuming but not difficult at all. Rather a fun activity to do but yes if you have time. It will be worth seeing your creativity in the end because it looks like you have purchased an expensive piece of the wreath. Isn’t it? Read the Tutorial to make it now. I call it sweet wreathe and if you love cooking and inviting guests on every festive occasion, just add this wreath to your to-do list and it will surely add value. Do not hang it outdoors because it is made up of crepe papers which obviously cannot handle the weather. Surprise your loved ones with the real chocolates by giving a hint to this wreath. Of course, chocolate would be there but have fun, tease a bit, put hints like this and make this a special day. Read the Tutorial to make it now. When there are so many hearts to place, either get a heart template or create it yourself otherwise it would be a mess. The base of this wreath is a pool noodle which is perfect because the whole idea of this wreath is to create a magical hearts ready to fly which cannot be achieved using a cardboard. If you also want to create the same magic, check this tutorial. Read the Tutorial to make it now. If you are finding a wreath to hang it to your window, then this would be perfect. Window wreathe is often ignored but this piece is one who gets noticed and very simple to make with cupcake liners. And, nothing to glue just push pins to secure the liners with the base material. Read the Tutorial to make it now. This is weird but worth it to show that you don’t like Valentine at all. Thinking why people get so over the top with those candies’ everywhere, huge teddy bears which can actually scare at night. Make this wreath and just give your message straight to everybody. Read the Tutorial to make it now. This is one of the corner decor ideas and that too cheap. Tissue paper is used here to make a wreath. So, you see when a wreath is made, the base material is hardly seen and it is up to you whether you take cardboard or a gauge wire. Both can make further steps different but choose one with whom you are comfortable and can make a beautiful wreath like this one. Read the Tutorial to make it now. Pretty amazing wreathe to DIY for the indoors. You can also make it a rotating one like roulette. For the time being, this is capable to catch the eyeballs and earn you much attention. The message is all your creativity and fun and the rest you could see in this tutorial. Read the Tutorial to make it now. A good way to get rid of any book you hate is book craft ides. Making wreathe is one of them and is worthy of the appreciation as well both for the book and the creativity. It could be a heart full of unknown information because most probably you haven’t even read the book. If you do not want to waste the book, try newspaper and the end look will be same that is of some scribbled information. Read the Tutorial to make it now. Old torn sweater is of no use until you make use of it by making this wreath. I like it because it is just the base wrapped around with sweater otherwise base does not get a chance to explore much. Pulling the sweater smoothly so it covers all the area perfectly could be tricky because of the size estimation you take. Learn more by watching this tutorial. Read the Tutorial to make it now. A simple yet unique heart and arrow wreath will fit in anywhere like any corner, window or the front door because it is that awesome. I suggest putting it on the window which gives a perfect message to your partner that your heart is trapped in their love. Read the Tutorial to make it now. This is a perfect front door wreath and the white ribbon bow completes the look. You need to be careful while adding the greenery because you may cut the piece which is not supposed to and it is then when the whole look will be spoiled. Greenery decorations are often misunderstood as easy ones but they are not so you have to be extra careful. Read the Tutorial to make it now. For all the gold lovers, here is the golden wreath mixed up with white to give an elegant look like this one. I like the hanging as well so the creativity does not just stop till wreath and say hang it with a ribbon. When it is perfect, everything has to look perfect. Read the Tutorial to make it now. Flower power for your indoor decor and so we are giving the idea of flower wreath, why not give this festive a decor basic of flowers. Starting with the wreath, it would be a hit among your house for sure. Paper flower is something which is not that difficult. Try this tutorial for sure. Read the Tutorial to make it now. A Strong wreath on the outdoors and the paper crafts on the indoors is the basic idea. So, this could be for your outdoors. Polka dots can never go out of fashion and this is why the basic material is taken as this fabric which can be fully wrapped around the wreath. The bow is enhancing the look as perfect. Read the Tutorial to make it now.